Orchid Snail (Zonitoides arboreus)Although quite a small species, the Orchid Snail is often cursed by greenhouse gardeners and orchid growers. This miniature invader, originally from North America only reaches about 6 mm in diameter. It has a reddish brown to pale horn-coloured shell that is disc-like in shape. The animal is bluish grey. It can be found living in and under pots, in orchids and under litter in gardens, greenhouses and cultivated areas. A widespread and succesful pest, it can cause considerable plant damage, and there are even records of it invading some native vegetation areas. 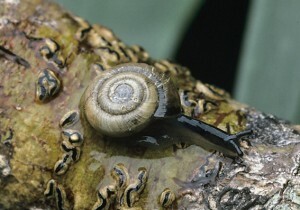 The Orchid Snail ranges from southern Victoria to north-eastern Queensland.